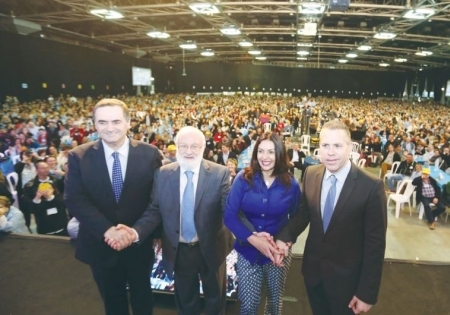 Jerusalem Post, February 25, 2016: Some 6,000 participants from 62 countries expressed support on Wednesday night for Israel at a Kabbalah conference at the Tel Aviv Fairgrounds. Guests of honor at the conference included, Transportation Minister Israel Katz, conference speaker Rabbi Michael Laitman, Culture and Sport Minister Miri Regev, and Public Security and Strategic Affairs Minister Gilad Erdan. Conference participants arrived from all over the world, including the US, England, France, Russia, Japan, Norway, Turkey and more. 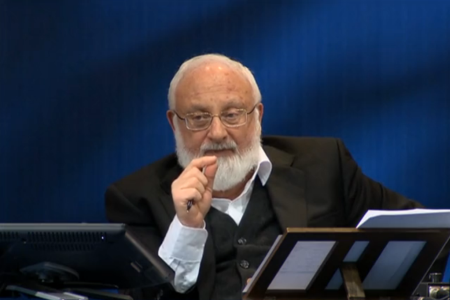 For the second time running, the World Zohar Convention 2014 hosted by Kabbalah.info continued to establish itself as one of the world’s most unifying and culturally diverse gatherings. Moreover, this year’s World Zohar Convention symbolized the launch of the first Hebrew publication of the Zohar L’Am (Zohar for All) book series, i.e. The Book of Zohar adapted for our generation. Tagged “Unity Transforms Reality,” the World Zohar Convention, held on February 5-7 at the Tel Aviv Trade Fairs Center, hosted over 10,000 attendees from 64 countries, and celebrated what The Zohar was intended for: the uniting of people through deeply transforming experiences, where by learning the hidden layers of nature and themselves, people uncovered the uniting and harmonious reality that exists at higher levels of perception. Record numbers made the journey to the 2014 convention. Many of the participants were attracted to the power of The Zohar and the study of Kabbalah by the Bnei Baruch Kabbalah Education & Research Institute’s free courses available through FreeKabbalahCourse.com, the Arutz 66 TV channel in Israel, and daily Kabbalah and Zohar lessons by the world’s foremost Kabbalist, Dr. Michael Laitman. With lessons and workshops led by Dr. Laitman based on The Zohar, attendees at the convention were guided to uncover the essence of The Book of Zohar, which is the inner, united and whole reality, above the boundaries of time and space, and which can be discovered by everyone who longs for it. Are You New to The Zohar? Tel Aviv, Israel, November 8 2010 — The 2010 World Kabbalah Convention, held on November 9-11, will host 7,000 people of all the world’s faiths, from 54 countries, speaking 38 languages, coming to celebrate what Kabbalah is really about – the connection among all people. Kabbalah is popularly mistaken as religion or mysticism, but the people attending this convention have delved deeper into Kabbalah and understand that it is a method with the sole aim of developing connections of love among people. The need for love is a point all people share, no matter what their faith, nationality, age or gender. 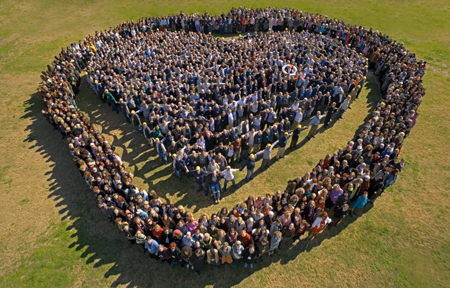 Those attracted to Kabbalah are those who found it increasingly difficult to fulfill this need in modern society, and the 2010 World Kabbalah Convention will serve to express this need, hosting people from all around the world who find it important to connect on a basis of love among all people. The 2010 World Kabbalah Convention will include lessons with Dr. Michael Laitman, founder and president of the world’s largest Kabbalah educational resource, the Bnei Baruch Kabbalah Education & Research Institute, www.kabbalah.info, author of over 30 books on Kabbalah, and the Internet’s most active spiritual blogger at www.laitman.com. The lessons will be followed by workshops, activities, meals and cultural events all aimed at bringing the deepest level of connection among people to life. Moreover, for the first time at an annual World Kabbalah Convention, not only will the event’s lessons and activities be broadcast on the Internet and on television, but there will also be roaming cameras during recesses, allowing convention attendees to share their impressions with tens of thousands of worldwide viewers, making it a non-stop 3 day broadcast on www.kab.tv and on the Israeli television Channel 66. 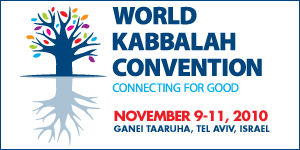 For five years running, the International Kabbalah Congress hosted by www.kabbalah.info has established itself as one of the world’s most culturally diverse gatherings for spiritual growth. A three-day celebration of human unity and deeply transforming personal experiences, the 2009 International Kabbalah Congress being held February 2-4 at the Tel Aviv Exhibition Grounds will host 6,000 guests from around the world. For a few brief days, the exhibition hall known as pavilion number 10 will become the warmest and most cordial place in the Middle East, and possibly even the entire world. Despite the tension between Israel and its neighboring countries, flight costs, and a growing uncertainty about the global financial situation, record numbers will make the annual journey to attend the 2009 congress. Many of the 6,000 participants arriving from over 52 countries will be first-timers attracted by past attendee testimonials of their life-changing experiences, fulfilling workshops, uplifting meals, emotional cultural evenings featuring music and cultural performances from all parts of the world, and timely Kabbalah lessons by the world’s foremost Kabbalist, Rav Michael Laitman PhD, explaining the current crisis and the way out of it. One of the highlights of this year’s festivities is a series of six mini-congresses planned for children ranging in ages from 3 to 18, whose main source of communication until now has been the virtual activities for children taking place on www.kab.tv. 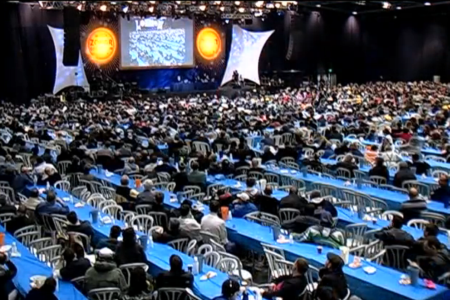 The 2009 International Kabbalah Congress is taking place at the Tel Aviv Exhibition Grounds in Israel hosting all the leading conferences and trade shows in the area. For a few brief days, the exhibition hall known as pavilion number 10 will become the warmest and most cordial place in the Middle East, and possibly even the entire world. Pavilion number 10 will be a place of magnificent diversity, a coming together of people of all ages and from all walks of life including celebrities, performing artists, engineers, road workers, dancers, administrators, students, musicians, stock-investors, teachers, performers, tradesmen, writers, DJs, plumbers, academicians, politicians, and designers, to mention a few. The International Kabbalah Congress aims to create a special environment that will allow participants to realize the true potential that lies in the connection between people. The organizers of the congress believe that if people could only invert the self-centered approach that bases human relationships, which is opposed to the global nature of life in the 21st century (thus producing the current financial, environmental, and educational crises), our world could change its course and begin moving towards tranquility, peace and prosperity. In other words, this congress aims to give its participants a taste of the better world we all dream about and the practical tools for taking our first steps toward becoming one big human family. For many participants, the International Kabbalah Congress will become a deep life-altering experience, where they will be encouraged to shatter the psychological barriers of previous identities and express themselves in new ways. The multi-faceted extravaganza will present the extremes of playfulness and vitality combined with serious inner focus and personal change, leaving a long-lasting impression on participants and the entire world. The result will be a never before seen mini-humanity rising from the shadows of today’s society.